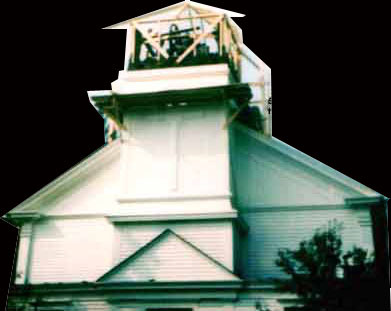 Note: Click on the door to enter the church OR click on the building to see a present day picture. 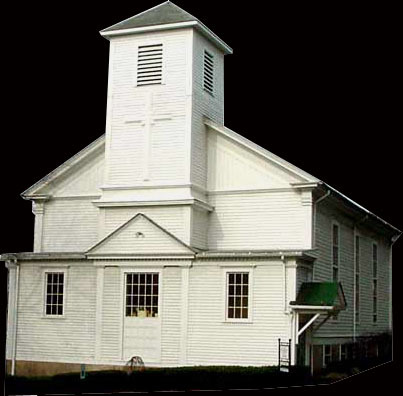 The Methodist Church in Smethport was organized on October 9,1837 when a subscription book was opened. In 1837 a lot was purchased from the commissioners of McKean County. 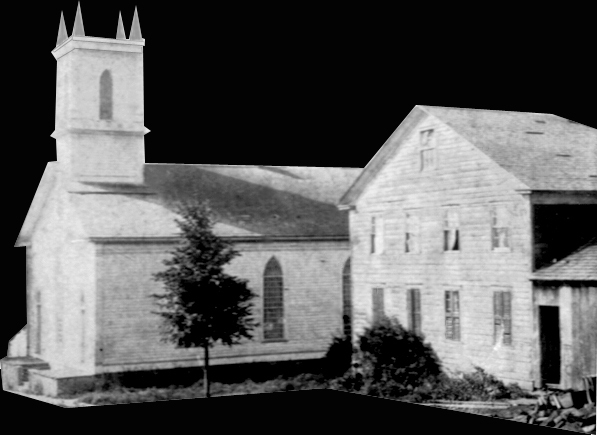 The building was completed and consecrated in 1838 for $3,000.00. The parsonage, which adjoins the church, was built in 1859. 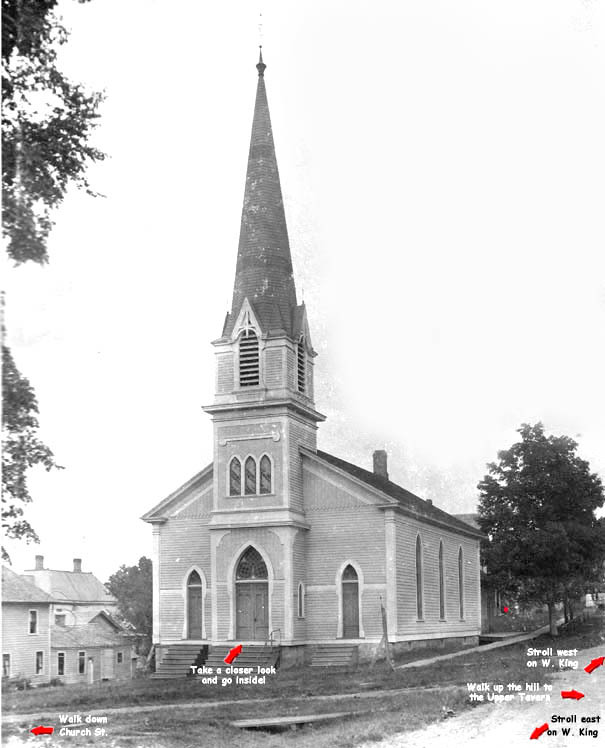 The Methodist Episcopal Church of Smethport is said to have had it's beginning about 1832. Under date October 9,1837, a subscription book was opened by the trustees. The subscription contracts were drawn for $500 down, but under the $500 heading a few men write their names for $5.00: Andrew Rifle, David Crow, Jr., Harvey Brewer, Richard Wooley and Daniel Rifle; Asa Sartwell contributed $300; Brewster Freeman, $200; Richard Chadwick, A. M. Stanton, Nathan White and Nathan Burlingame, $100; Samuel Smith, David Crow, Thornton Barrett, $50; John Needham, James O. Gunning, David C. and Warren Lucore, $25; Horace B. King, $20 in nails; David Comes and Lew R. Hawkins, $25; Hiram Payne, John E. Niles, Salmon M. Rose, A. Burlingame, Harvey Brewer, Cephas Scott, Dudley Birge, J.L. Birge, W.Y. McCoy, Charles Smith, Leonard Rice, Isaac Thompson (who subscribed $10 worth of axes), William C. White, Joel Sartwell, L.F. Maynard, E.C. Chandler, Horace and Milo Scott, Anson Rice and Barnabas Graves were also among the subscribers. The society was incorporated incorporated with Samuel Smith, Cephas Scott, Willis Barrett, Daniel Rifle and Gardner Barrett, trustees. The petitioners were Sandusky Miller, H. B. King, John Mills, R. Chadwick, D.S. White, Daniel brown, W.J. Colegrove and C. Steele. In 1837 a lot was purchased from the commissioners of the county, and the present house was built by Sol. Sartwell and P. Ford. It was completed, in 1839, at a cost of $3,000, repaired in 1865 at at an expense of $1,000, and in 1880 at $2,000. The parsonage was built in 1859, adjoining the church. The past recording stewards were Richard Chadwick, S. M. Rose, David S. White, I. S. Gleason, H. L. Burlingame and W. J. Colegrove. The present recorder is W. P. Eckels. The roll of preachers from 1832 to 1889 is as follows: 1832, William Butts and Samuel Gregg; 1833, Thomas J. Jennings, Benjamin Preston and Joseph A. Halback; 1834, Ignatius H. Hacket, Amer G. Smith and Bryan S. Hill; 1835, John Demming, Matthew Hanna and Lorenzo Whipple; 1836, Augustin Anderson and J. W. Stryker; 1837, A. Anderson, F. W. Conable and J. F. Mason and John Glass; 1838, Alpha Wright and F. W. Conable; 1839, Horatio M. Seaver and J. W. Stryker; 1840, H. M. Seaver and Hugh Ely; 1841, A. Haywood and J. Hagar; 1842, J. P. Kent, J. Hagar and John Glass; 1843, J. F. Mason and John Glass; 1844, J. F. Mason; 1845, J. Pearsall; 1847, F. W. Conable and J. McCleary, Jr. ; 1848, James McCleland; 1850, E. B. Pratt; 1851, R. E. Thomas; 1852, Hiram Hood; 1854, Withan H. Kellogg; 1855, H. W. Annis; 1857, J. J. Roberts; 1859, S. D. Lewis; 1860, Alonzo Newton; 1862, L. A. Stevens; 1864, Lowell L. Rogers; 1866, William Blake; 1867, Roswell R. Purce; 1868, E. B. Williams; 1870, W. Gordon and F. D. Sargent; 1871, H. Peck; 1873, J. L. Rushidge; 1875, J. C. Whiteside; 1878, W. B. Waggoner; 1881, E. P. Hubbel; 1884, William Bradley, and 1887-89, T. W. Chandler. 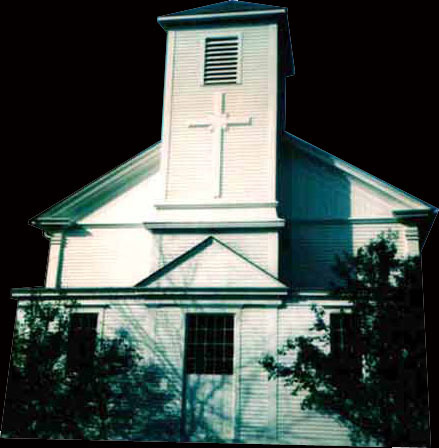 The presiding elders are named as follows: 1832, J. s. Barris; 1833, H. Kinsley; 1836, A. Abell; 1837, J. Hemingway; 1841, J. Durham; 1844, Thomas Carlton; 1845, William Hosmer; 1846, J. G. Gulick; 1848, Elija Thomas; 1850, A. D. Wilbor; 1852, J. C. Kigsley, 1854, C. D. Burlingham; 1858, E. E. Chambers; 1862, A. P. Ripley; 1866, W. S. Tuttle; 1870, E. A. Rice; 1873, L. D. Watson; 1878, L. A. Stevens; 1882, O. S. Chamberlayne, and 1886, T. J. Bissell. Carlton, above named, was one of the Methodist Book Concern for twenty years; Hosmer died in June, 1889. He was an abolitionist. Thomas was killed in the Modoc war. 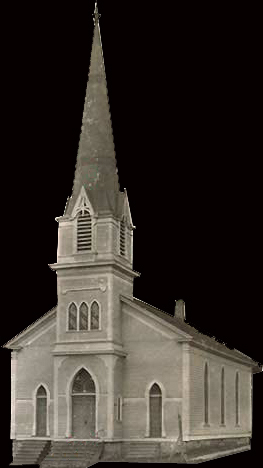 The membership of this church is placed at fifty and the value of property at $5000. During the early history of the church as many as three ministers served the parish in a single year. The first minister was the Rev. Alpha Wright with the Rev. F.W, Connable acting as his assistant. The Rev. Thomas Carlton, who served the church, beginning in 1844, later became a member of the Methodist Publishing House. The Rev. L. A.
Stevens, minister in 1878, published a monumental work on the history of the Methodist Church. 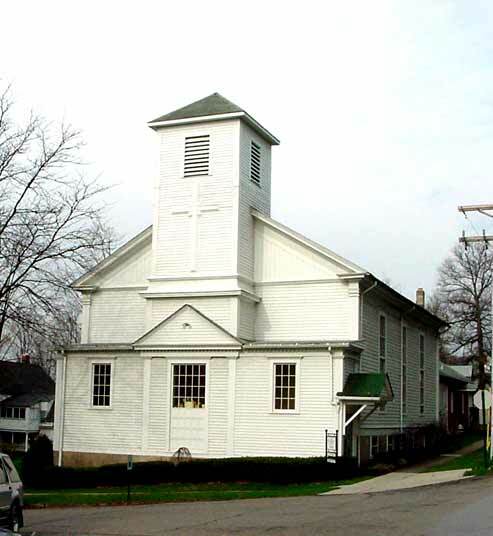 Angeles, California, began his ministry in Smethport. Dr. Helms is now minister emeritus of the church in Los Angeles. native land, matriculated in music, before coming to the United States in 1906. After studying theology in Chicago, he was ordained a minister in the First Methodist Church of Buffalo in 1918 by the Right Rev. Bishop William Burt, celebrant. Springs, N.Y., Eldred, Port Allegheny, Naples, N.Y. and Elma, N.Y. The Rev. 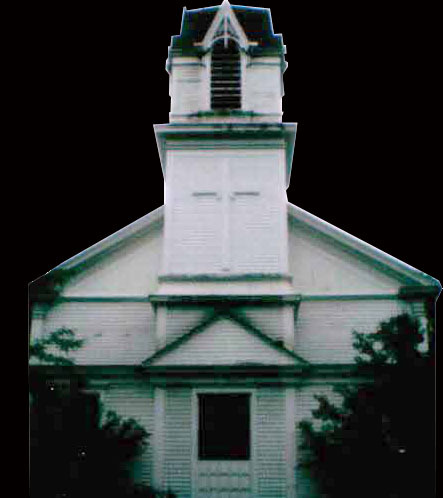 Mr. Burton, appointed to the Smethport parish by Bishop Charles Wesley Flint, then presiding bishop of the Genesee Conference and formerly chancellor of Syracuse University, has served the Methodist Church of Smethport longer than any other minister. Bishop Flint is now Bishop of Washington, D.C. The Rev. Mr. Burton often remarks to his friends, "cymri am byth"; a proverbial saying in Wales which means "Wales forever". McKean County Miner, July 7, 1949. History of the Counties of McKean, Elk, Cameron and Potter, Pennsylvania, with Biographical Selections, Volume 1. Chicago: J.H. Beers & Co., Publishers, 1895. Ladies Organize on Wednesday Night The ladies of the M. E. church gave a ten cent supper at the church parlors on Wednesday night, which was quite well attended. A good social time was experienced. Union Gospel Meeting Big The union gospel temperance meeting at the methodist church last Sunday night was largely attended. Rev. G. W. Halliwell, pastor of the Baptist church, delivered a powerful address on the subject of temperance, which received the closest attention of the audience. The recitation of Miss Ora Biever was delivered in a very creditable manner and was well received. Silver Metal Contest at Church There will be a silver medal contest at the Methodist church in Smethport on Saturday evening, February 9. The contestants are Misses Kate Calkins, Nellie Roberts, Madge Rifle, Inez Hibbard, Martha Brennan and Myrtle Peck. Good music will be furnished. The entertainment will be a good one. Admission 10 ets. Entertainment begins at 8 p.m. Everybody is invited.